ARLINGTON, VA; NOVEMBER 13, 2014– The holiday season on PBS is a cornucopia of drama, comedy, music and food. Specials from popular series CALL THE MIDWIFE and VICIOUS, music that’s inspirational, festive, classic and jazzy, and a culinary special that draws on Southern and Chanukah traditions add sparkle and spice to the schedule. 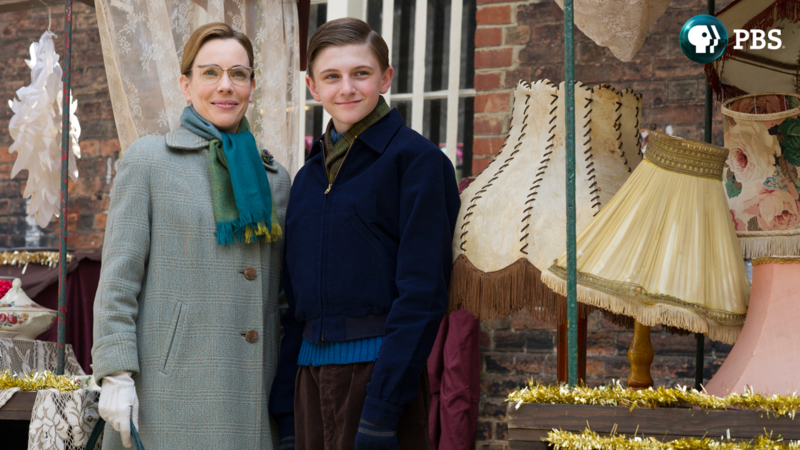 The CALL THE MIDWIFE HOLIDAY SPECIAL, airing Christmas night, December 25, 8:00 p.m. ET, follows the nuns and nurses of London’s Nonnatus House as they prepare for the Sunday School Christmas concert and continue their ministrations to the Poplar population. As the year ends, all wonder what 1960 has in store for them. The VICIOUS comedy special, also set in London, follows. Longtime couple Freddie (Ian McKellen) and Stuart (Derek Jacobi) host a holiday party at their flat, where a wicked game of Truth or Dare brings up hidden truths — and some surprises. VICIOUS “Holiday Special” airs December 25, 9:30 p.m. ET. Anticipating the Christmas season, luminous soprano Renée Fleming, accompanied by special guests, sings heartwarming carols in RENÉE FLEMING — CHRISTMAS IN NEW YORK, airing December 4, 2014, 9:00 p.m. ET (check local listings). Soprano Deborah Voigt adds her considerable vocal talents to those of the renowned Mormon Tabernacle Choir in CHRISTMAS WITH THE MORMON TABERNACLE CHOIR FEATURING DEBORAH VOIGT AND JOHN RHYS-DAVIES. Rhys-Davies dramatizes Charles Dickens’ Ghost of Christmas Present. The program premieres December 19 at 9:00 p.m. ET and encores December 25, 10:00 p.m. ET. The centerpiece of many seasonal events is — naturally! — food. Chef Vivian Howard draws on her Southern heritage and husband Ben’s Chanukah traditions for a charming and delicious holiday celebration. A CHEF’S LIFE HOLIDAY SPECIAL airs December 16 at 10:00 p.m. ET. PBS closes out 2014 with an evening of music in New York City venues: LIVE FROM LINCOLN CENTER “New York Philharmonic New Year’s Eve: Gershwin Celebration With Dianne Reeves and Norm Lewis” on December 31 at 8:00 p.m. ET, followed by MICHAEL FEINSTEIN NEW YEAR’S EVE AT THE RAINBOW ROOM at 10:00 p.m. ET. PBS KIDS will kick off the holiday season on November 26 with the return of the classic family favorite CURIOUS GEORGE: A Very Monkey Christmas on PBS stations nationwide. In this fun-filled one-hour special, families can join their favorite monkey and the Man with the Yellow Hat as they count down the days until Christmas. The fun continues throughout December with all new episodes across the schedule on PBS stations. Viewers will help Otto and Olive solve a reindeer case in an all-new episode of ODD SQUAD, celebrate Christmas and Hanukkah with Peg and Cat in a one-hour PEG + CAT + HOLIDAYS special, spread cheer with new engine friends Gator and Reg on THOMAS & FRIENDS and go on a winter adventure featuring The Nutcracker Ballet with Daniel Tiger. Select clips and full episodes will also be available on pbskids.org, the PBS KIDS Video App and PBS KIDS on Roku, Apple TV, Chromecast and Amazon Fire. For listings and more information, click here. Celebrate the holidays with PBS and enjoy special programming online, get tips on how to prepare for family gatherings, plan your shopping list, enjoy music from our holiday playlists, make crafts with your children and get great meal ideas from both PBS Food and PBS Parents. PBS LearningMedia has expanded its digital library with the addition of a new Holiday Collection featuring curriculum-targeted resources that align to key celebrations throughout the year. Teachers and students of all ages can use these digital resources to enhance classroom activities and homework assignments, or to construct interactive storyboards using PBS LearningMedia’s new suite of productivity tools. Currently, the collection delves into the history of Halloween and Columbus Day, among others, and will soon include additional resources about Thanksgiving, Hanukkah, Christmas, Kwanza, Valentine’s Day, Presidents Day and Ramadan. Explore the collection today by visiting pbslearningmedia.org/collection/holidays. Celebrate the magic of the season with the acclaimed soprano and guests Kurt Elling, Kelli O’Hara, Gregory Porter and Rufus Wainwright. The most wonderful time of the year is captured in unique musical performances of favorite holiday songs and carols. Bruce Feiler embeds with a group of active duty and retired U.S. military, wounded in Afghanistan, Iraq and other American wars, as they travel to the Catholic shrine of Lourdes in southwest France in search of healing. More than five million pilgrims visit this shrine to the Virgin Mary every year to bathe in the waters of a spring that Catholics believe has miraculous powers. The wounded warriors from America join 30,000 other military and their families from 35 different nations on an International Military Pilgrimage that’s now in its 55th year. Chef Vivian Howard serves up the best of her Southern cooking heritage and husband Ben’s Chanukah traditions. From a simple corned ham to an upscale oyster dressing, from humble Hoppin’ John to an elegant red velvet cake, this is a charming and delicious holiday celebration. Leading dramatic soprano Deborah Voigt and acclaimed British actor and voice artist John Rhys-Davies join the Mormon Tabernacle Choir and Orchestra at Temple Square in a concert of holiday favorites. Among the highlights are Voigt’s performances of “The Holly and the Ivy” and the light-hearted “The Twelve Days After Christmas” and Rhys-Davies’ dramatization of “A Dickens Christmas” as the Ghost of Christmas Present. In a dazzling scene of aerial choreography, he soars overhead at the LDS Conference Center. Host Bruce Feiler travels to Israel with Jewish and Christian pilgrims. Walking with Christian pilgrims on the Jesus Trail, celebrating Sukkot, the Feast of the Tabernacles, with American Jews in Jerusalem and exploring the past with scholars of the three faiths — Judaism, Christianity and Islam — that share Jerusalem, Feiler reveals a land where religious and historical divisions have made it the most contentious place on earth. Rehearsals for the Sunday School Christmas concert are underway, creating inconvenience for the nuns and nurses of Nonnatus House. Two unmarried patients are dispatched to York Lodge, a badly managed home for pregnant women. Chummy takes over running the facility after an outbreak of chicken pox there. Dr. Turner treats a destitute older couple, former residents of a mental hospital closed under the mental health reforms. As residents of Nonnatus welcome the new year, the question on everyone’s mind is, what will 1960 bring? Continuing a broadcasting tradition, LIVE FROM LINCOLN CENTER presents the annual New York Philharmonic’s New Year’s Eve celebration concert. This year’s gala rings in 2015 with George Gershwin favorites, featuring Dianne Reeves and Norm Lewis. Bramwell Tovey conducts. Ring in 2015 with entertainer Michael Feinstein. The energetic performer recaptures the heyday of the glamorous New York nightclubs as he hosts this celebration from high atop 30 Rockefeller Plaza in the glittering, newly restored Rainbow Room. Guests include Darren Criss (“Glee”), Aaron Tveit (“Graceland”), Leslie Odom (“Smash”), Broadway star Kelli O’Hara, nightclub legend Marilyn Maye, Tony Winner Christine Ebersole and 17-year-old Julia Goodwin. From Trondheim’s historic Nidaros Cathedral, this holiday concert features the St. Olaf Choir from St. Olaf College and the Norwegian girl choir, Nidaros Jentekor. The production pairs the cathedral’s gothic beauty and stunning acoustics with the distinctive a cappella singing style for which the St. Olaf Choir — which owes its origins and legacy to Norway — is internationally known. Musical selections include innovative arrangements of Christmas music, gospel spirituals and Norwegian hymns and folk songs. FRONTLINE presents the epic story of the rise of Christianity. Drawing upon new and sometimes controversial historical evidence, the series transports viewers back 2,000 years to the time and place where Jesus of Nazareth once lived and preached and challenges familiar assumptions and conventional notions about the origins of Christianity. The first program traces the life of Jesus of Nazareth, exploring the message that helped his ministry grow and the events that led to his crucifixion around 30 C.E. The second program examines the period after the first revolt, tracing the development and impact of the Gospels and looking at the increasingly hostile relationship between the Christians and the Jews. Taped in Macon, Georgia’s historic Grand Opera House, students and faculty from Mercer University’s Townsend School of Music and its renowned Robert McDuffie Center for Strings perform classical Christmas selections and exclusive new arrangements by noted Boston Pops arranger Randol Bass and Grammy Award-winner Matt Catingub.